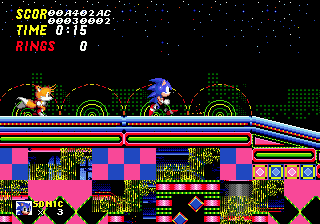 The beginning of Casino Night Zone, but whats with the design? 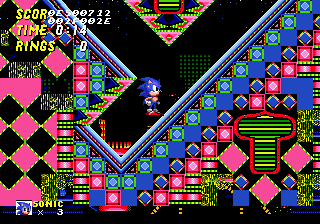 Originally Casino Night Zone was much more pink, blue, and lime green, a far departure from the final game design. 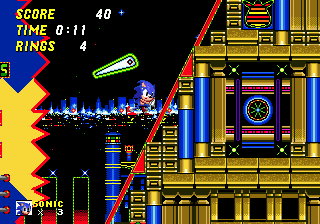 Here's a comparison shot between the two versions. the final Casino Night is a golden colour, with a richer and more filled backdrop. 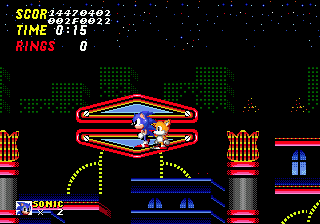 Like Wood Zone, Casino Nights conveyor belts do not work, and simply stand as platforms. 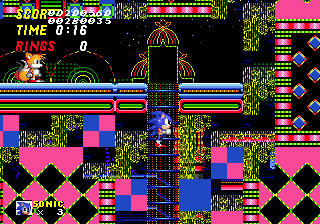 The elevators have yet to be implemented, but Sonic can still fall down the holes left by them. The spring is missing from the pinball plunger. 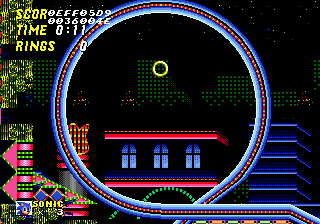 This picture is also a good showing of the different style used in the original Casino Night. This spagetti strand loop-de-loop is very different to the final. the final is encased in a square box made from the landscape, which usually has an item on top of it. 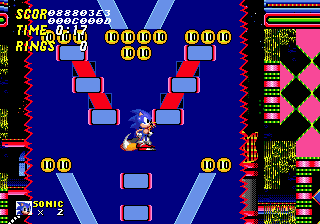 The scoreboard pinball areas are still here, but vastly different. The flippers and 'point catchers' are also missing. 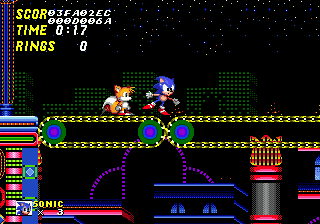 The bumpers have also no effect on Sonic or Tails, they fall straight through it.